When: Tuesday, June 10, 2014 6:30 p.m.
Foreign Correspondent was Alfred Hitchcock’s second American film. On loan-out to producer Walter Wanger, Hitchcock enjoyed a level of freedom that he hadn’t experienced on the set of Rebecca with David O. Selznick. Although the director didn’t get the stars he wanted, he had almost unlimited resources to create a first-class suspense classic. Wanger owned a property called Personal History, the memoir of a journalist named Vincent Sheean. He had owned the rights to the memoir since 1935, but was unable to turn it into a workable property. When Wanger learned that Hitchcock was available on loan-out from Selznick, he jumped at the chance to hire him. Hitchcock and his team worked over the memoir, in effect rewriting it so that it would appeal to contemporary audiences. The producer was hoping that along with Hitchcock he could borrow Joan Fontaine and Brian Aherne, who were recently married as his stars. Hitchcock wanted Gary Cooper and Barbara Stanwyck. Cooper turned him down, saying he didn’t want to star in a thriller and Stanwyck was unavailable. 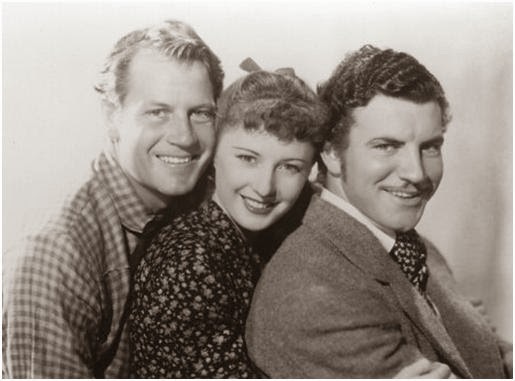 In the end, the director had to settle on Joel McCrea and Laraine Day. Although not as big a star as Cooper, McCrea was a star in his own right. Day was a contract player at MGM who starred in the popular Dr. Kildare series with Lew Ayers. In spite of the director’s disappointment with the casting, he got terrific performances out of his leads. McCrea and Day had genuine chemistry that is both charming and believable. The plot revolves around Johnny Jones, (McCrea) christened “Huntley Haverstock” by his newspaper’s editor (Harry Davenport) as a newly minted American foreign correspondent. On assignment in Europe, he is tasked to find out if the continent is on the brink of a World War. In Holland, Haverstock meets Carol Fisher (Day), daughter of Stephen Fisher, (Herbert Marshall) head of the Universal Peace Party. When a Dutch diplomat named Van Meer, (Albert Basserman) is assassinated, the plot really takes off. Who killed Van Meer and why? And is the head of the Universal Peace Party really working for peace in Europe? 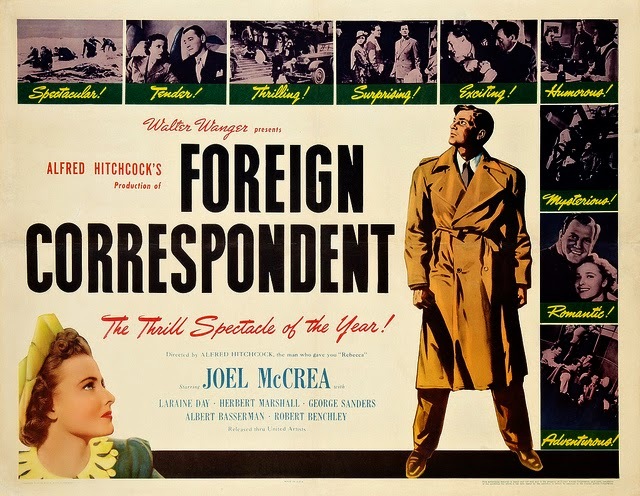 Foreign Correspondent set the template for future Hitchcock films, including Saboteur and North By Northwest. With its amazing set pieces and complicated action sequences, it is a master class in film making. We’ll discuss the film, it’s reception and influence. Join us! Who is that man reading the paper? Besides the other cast members already mentioned, the outstanding supporting players also includes George Sanders (playing a good guy this time), Edmund Gwen, and Robert Benchley, who supposedly wrote his own dialogue. Before the movie, grab a cup of coffee from Overflow Coffee Bar, located within the Daystar Center. You can bring food and beverages into the auditorium; we even have small tables set up next to some of the seats. The Chicago Film Club is for classic movie fans. Once a month we screen a classic film and have a brief discussion afterward. For more information, including how to join (it’s free), click here. To purchase your ticket in advance, click here. The Venue 1550 is easily accessible by the CTA. Please visit Transit Chicago for more information on transportation options.